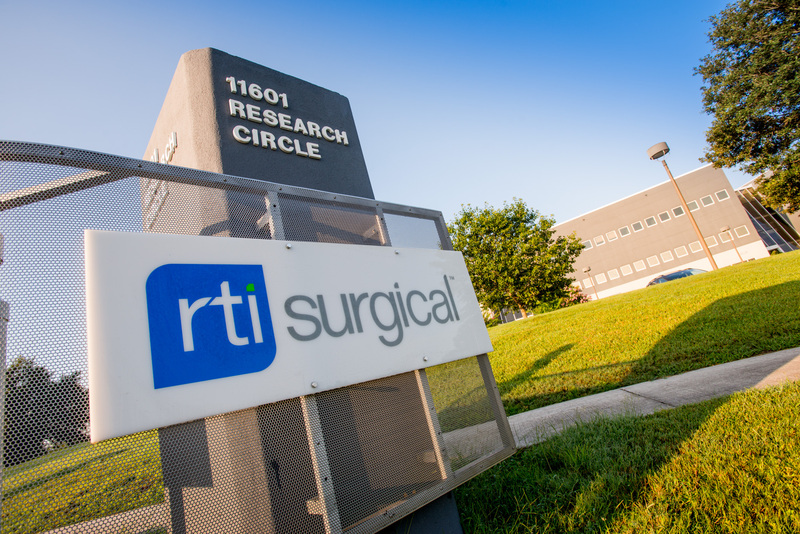 RTI Surgical® Announces Second Quarter 2018 Results - RTI Surgical Holdings, Inc.
Alachua, Fla. – August 2, 2018 – RTI Surgical, Inc. (Nasdaq: RTIX), a global surgical implant company, reported operating results for the second quarter of 2018. RTI’s worldwide revenues for the second quarter of 2018 were $70.7 million, down slightly compared with $72.1 million during the same period for the prior year. Excluding a $3.7 million reduction from the sale of substantially all the assets of the cardiothoracic closure business completed in August 2017, our total revenues increased $2.2 million, or 3.3%.Gross profit for the second quarter of 2018 was $30.0 million, inclusive of a $6.8 million charge for the write-off of excess inventory related to decreased distributions of our map3® implant and the purchase accounting step-up of Zyga inventory. To partially offset the impact of the decreased distribution of map3® implant we signed a distribution agreement with Aziyo Biologics, Inc., to supplement our biologics portfolio with an alternative allograft stem cell product. Excluding the excess inventory charge and purchase accounting impact, our Adjusted Gross Profit for the second quarter of 2018 was $36.8 million or 52.1% of revenues, compared to $37.0 million, or 51.3% of revenues, in the second quarter of 2017. During the second quarter of 2018, RTI incurred non-recurring pre-tax charges to support the ongoing strategic transformation of the business. The company incurred $4.5 million in asset impairment and abandonment charges related to decreased distribution of our map3® implant. During the second quarter of 2017, the company incurred $3.4 million of non-recurring pre-tax charges. Net loss applicable to common shares was $6.4 million, or $0.10 per fully diluted common share in the second quarter of 2018, compared to a net loss applicable to common shares of $2.6 million, or $0.04 per fully diluted common share in the second quarter of 2017. As outlined in the reconciliation tables that follow, excluding the impact of the various non-recurring charges, Adjusted Net Income applicable to common shares was $2.0 million, or $0.03 per fully diluted common share in the second quarter of 2018. Adjusted earnings before interest, taxes, depreciation and amortization (Adjusted EBITDA), for the second quarter of 2018 was $9.1 million, or 13% of revenues compared with $8.3 million, inclusive of $1.2 million of EBITDA related to the cardiovascular closure business, or 11% of revenues for the second quarter of 2017. The increase in Adjusted EBITDA is primarily driven by the reduction in operating expenses associated with efforts to reduce complexity and increase operational excellence implemented during 2017. The Company expects full year Adjusted EBITDA to be in the range of $32 million to $38 million. Continued demand of map3® cellular allogeneic bone graft or alternative allograft stem cell product. RTI Surgical is a leading global surgical implant company providing surgeons with safe biologic, metal and synthetic implants. Committed to delivering a higher standard, RTI’s implants are used in sports medicine, general surgery, spine, orthopedic and trauma procedures and are distributed in more than 40 countries. RTI has four manufacturing facilities throughout the U.S. and Europe. RTI is accredited in the U.S. by the American Association of Tissue Banks and is a member of AdvaMed. For more information, please visit www.rtix.com. This communication contains forward-looking statements within the meaning of the Private Securities Litigation Reform Act of 1995, including the statements made in this communication about our positive operational and financial performance, the continued contribution of the OEM franchise to RTI’s growth, the impact of operational priorities on costs and their impact on RTI’s financial performance, RTI’s ability to meet its commitments, the implementation of RTI’s strategic initiatives, the reduction in complexity of RTI’s operations, RTI’s ability to maintain partnerships in the organ procurement community, RTI’s ability to expand the number of patients it is able to serve, the integration of Zyga’s operations, anticipated financial results, growth rates, new product introductions, and future operational improvements. These forward-looking statements are based on management’s current expectations, estimates and projections about our industry, our management's beliefs and certain assumptions made by our management. Words such as "anticipates," "expects," "intends," "plans," "believes," "seeks," "estimates," variations of such words and similar expressions are intended to identify such forward-looking statements. The forward-looking statements are not guarantees of future performance and are based on certain assumptions including RTI’s ability to reduce inventory, manage expenses and accomplish its goals and strategies, the quality of the new product offerings from RTI, general economic conditions, as well as those within RTI’s industry, RTI’s ability to integrate acquisitions into existing operations, and numerous other factors and risks identified in the Company’s Form 10-K for the fiscal year ended December 31, 2017 and other filings with the Securities and Exchange Commission (SEC). Our actual results may differ materially from the anticipated results reflected in these forward-looking statements. Copies of the company's SEC filings may be obtained by contacting the company or the SEC or by visiting RTI's website at www.rtix.com or the SEC's website at www.sec.gov. To supplement the Company’s unaudited condensed consolidated financial statements presented on a GAAP basis, the Company discloses certain non-GAAP financial measures that exclude certain amounts, including EBITDA, Adjusted EBITDA, Adjusted Net Income Applicable to Common Shares, Adjusted Net Income per Common Share – Diluted and Adjusted Gross Profit. The calculation of the tax effect on the adjustments between GAAP net loss applicable to common shares and non-GAAP net income applicable to common shares is based upon our estimated annual GAAP tax rate, adjusted to account for items excluded from GAAP net loss applicable to common shares in calculating Adjusted Net Income Applicable to Common Shares-Diluted. A reconciliation of the non-GAAP financial measures to the corresponding GAAP measures is included in the tables listed above. Asset impairment and abandonments – This adjustment represents an asset impairment and abandonments related to decreased distributions of our map3® implant. Management removes the amount of these costs from our operating results to supplement a comparison to our past operating performance. Acquisition and integration expenses – This adjustment represents charges relating to acquisition and integration expenses due to the purchase of Zyga. Management removes the amount of these costs from our operating results to supplement a comparison to our past operating performance. Inventory obsolescence and reserve charge – This adjustment represents charges relating to inventory obsolescence due to the rationalization of our international distribution infrastructure and an inventory reserve charge related to decreased distributions of our map3® implant. Management removes the amount of these costs from our operating results to supplement a comparison to our past operating performance. Inventory purchase price adjustment – This adjustment represents the purchase price effects of acquired Zyga inventory that was sold during the six months ended June 30, 2018. Management removes the amount of these costs from our operating results to supplement a comparison to our past operating performance. Loss on extinguishment of debt – This adjustment represents costs relating to refinancing our debt. Management removes the amount of these costs from our operating results to supplement a comparison to our past operating performance. EBITDA, Adjusted EBITDA, Adjusted Net Income Applicable to Common Shares, Adjusted Net Income per Common Share – Diluted, and Adjusted Gross Profit should not be considered in isolation, or as a replacement for GAAP measures. The Company believes that presenting EBITDA, Adjusted EBITDA, Adjusted Net Income Applicable to Common Shares, Adjusted Net Income per Common Share – Diluted and Adjusted Gross Profit in addition to the related GAAP measures provide investors greater transparency to the information used by management in its financial decision-making.The Company further believes that providing this information better enables the Company’s investors to understand the Company’s overall core performance and to evaluate the methodology used by management to assess and measure such performance.